Much of my inspiration for what to talk or write about comes from watching various others explain what should be reasonably basic concepts, and finding their explanations incorrect, obtuse, or incoherent – or, in many cases, all of these things at once. The piaffe is a marvelous example. Google it, and count the the number of people actually riding a horse in piaffe who are also telling you how they got there. Forget the groundwork mavens, chasing their horse around the arena in an early doux piaffe with a small team of grooms holding whips. You don’t want to have to hire a full time staff about it. Just: How does one really train it from the very beginning to the very end? Good luck with your search. I’ll be right here. The notion of the complex equivalent “on the bit” is another target-rich topic. Virtually no one gets this right for one simple reason: Few seem to have any idea what it really means – including and especially very many people who charge money to tell people what it (doesn’t) mean. So here you are, then – and for free. Firstly, “on the bit” does not mean “pushing the horse into the traction of the reins against his lower jaw”, which is what approximately 95% of the folks who answer the question – using whatever words – seem think it means. They erroneously mistake a notion unique to the German School with a precept of High School itself (which it is not) – versus the opinion of a particular denomination of High School (which it is). This is akin to asking a Catholic how Christians get to Heaven, and being told: Confession. Protestant denominations of the religion may beg to differ. Your horse is “on the bit” if you can lightly feel him and easily direct him through the reins. Period. Being on the bit is akin to being on the phone. Either he’s on the other end, or he’s hung up. It doesn’t really matter how he’s standing, what he’s wearing, or what have you – he just has to be on the other end and listening – which implies not resisting. Depending upon your horse’s stage of development – considering his education to date, and present physical condition – his neck may be higher or lower; his face beyond the vertical, or even inside. No worries. 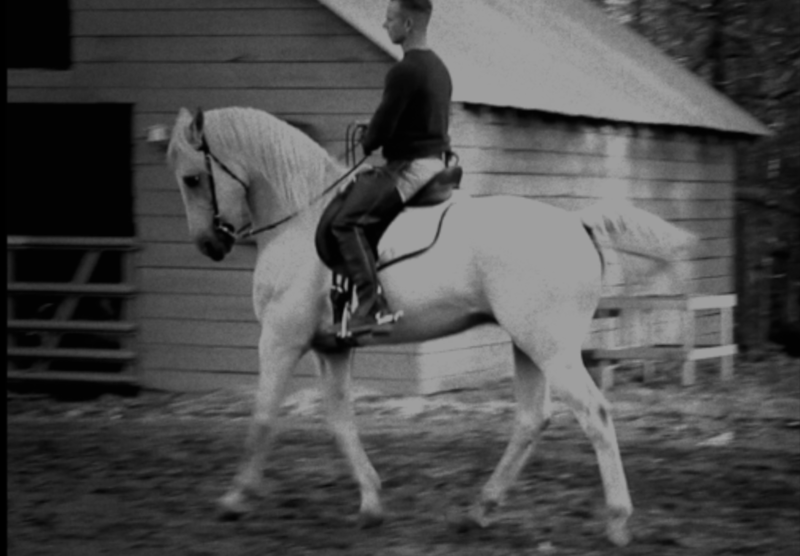 His physical positioning is entirely arbitrary with respect to his “on the bit-ed-ness” because the term does not imply any particular physical positioning of his neck or head, nor the particular amount of traction he will accept on the reins. There a different term for the degree of traction on the reins – it’s called appui. In particular and especially, “on the bit” does not imply the over-bent, over-low position I see horses assume in the bajillion YouTube videos presenting the topic – a position invariably following an instructor’s warning that the horse is about to be “on the bit” – most of whom are riding Germanized warmbloods on their forehands. In the context of a high school horse or a high school horse in training, ‘on the bit’ implies ‘in hand’, equivalent to the classical or Baucherist mise en main. With the horse mise en main, he is ready to accelerate, decelerate, collect, extend, turn, or halt, based on the operator’s indication from the hand. An advanced horse should also be ready to dispose his head and neck such that it best suits the current figure or movement – which will be higher if he is moving rassemble (in collection), or lower if he is pushing into extension, assuming the correct pli or bend, as appropriate. Only under such a circumstance can we really say he is “on the bit”. The horse should always be on the bit from the time we mount until we dismount. To the extent he’s not, we have no real way of knowing whether his jaw is relaxed and responsive – a feature we must constantly confirm, and, if necessary, re-instantiate if needed from the halt. Going “off the bit” independently represents resistance. He is either desiring to look a different direction than the one he should be facing (based on our current directives), or he’s simply feeling compressed and seeking to “escape” the confinement of the aids; or we may be asking for too much vertical flexion for it to be comfortable at his stage of physical development. Each particular resistance has its own solution. As with all cases of resistance, we have to use our best judgement to diagnose the issue, always erring on the side of presumed innocence in cases where multiple potential causes exist. We should always give the horse the benefit of doubt, gently checking or lifting him with the hand alone to get his attention before appealing to the combined effect with an approach of the legs.